Oconee County took first steps Tuesday night toward building broadband infrastructure to provide high-speed Internet both in the northern developed and southern undeveloped parts of the county. The Board of Commissioners told County Administrator Justin Kirouac to go forward with seeking qualified partners to build off a proposed fiber network to provide Internet services to homes and businesses. Estimated cost of the fiber network is $4.6 million, and consultant Teton Telecom, based in Watkinsville, said the county would spend about that amount over the next 20 years for network services it currently is using. Construction of the network could be completed by the end of 2020, Tetom Telecom projects. In other action on Tuesday night, the Board of Commissioners approved a $2.4 million contract for an addition to the Courthouse in Watkinsville and authorized Board Chairman John Daniell to sign documents for a grant application for expansion of the Senior Center in Oconee Veterans Park. The Board also gave tentative approval for an architectural contract for $48,700 for an addition to the county’s Animal Shelter, for initiation of the filing process for creation of a county Visitor’s Bureau, and for an intergovernmental agreement for an extension of Bishop Farms Parkway. County Administrator Kirouac told the Board that Teton Telecom had been commissioned to perform a fiber feasibility study to promote the development of high-speed Internet for the county. Inadequate Internet access has been a frequent complaint by citizens and businesses in the county. Mark Metcalf, president of Teton Telecom, told the Board that the county and its citizens “could benefit greatly from reliable high-speed broadband access at affordable prices” and that his goal was “to provide the best options available” for delivery of the needed infrastructure. Metcalf joined with Paul Belk, president of North Georgia Networks of Clarkesville in Habersham County, in completing the study. The “third party” would build off the network to provide services to homes and businesses in the county. Metcalf is proposing that the county build two fiber optic rings, one covering the northern part of the county roughly north of New High Shoals Road and the other covering the south. Both rings would converge at the Courthouse in Watkinsville, creating a figure eight design. The lines would be underground and would connect the county’s facilities and schools as well as serve as the backbone for future business and residential build-outs. The northern route would consist of 44 miles of cable, while the southern route would be made up of 36 miles. The recommended design calls for the installation of two conduits. The second conduit would provide for additional security but also could be sold in later years, the report stated. The county is expecting it to take three to six months to identify partners for the project. The Board of Commissioners gave tentative approval Tuesday to an Intergovernmental Agreement with the University of North Georgia for the extension of Bishop Farms Parkway to connect Georgia Highway 53 (Experiment Station Road) and New High Shoals Road. The extension would provide a secondary point of ingress and egress for students and allow the university to expands its Oconee County campus. Through the agreement the county agreed to construct the extension at its expense, with the University of North Georgia contributing $200,000 if construction begins by June 30, 2020. The Board put the Intergovernmental Agreement on the consent agenda for its meeting on April 2, meaning it will be approved without further discussion unless a commissioner asks for its removal from the consent agenda. The Board approved a Guaranteed Maximum Price contract with Kevin Price Construction, 2500 Daniells Bridge Road, for the $2.4 million construction of a sally port and three-story addition to the rear of the Courthouse in Watkinsville. The construction will add 9,000 square feet to the building to accommodate judicial operations. Merry Howard, the director of the Senior Center, told the Board that the grant application is nearly complete for expansion of the Senior Center and asked that Chairman Daniell be authorized to sign off on the final documents. The Georgia Department of Community Affairs administers the federal grant program that the county hopes can provide money to add space for programs at the Senior Center. The Board approved Howard’s request. The Board put on the consent agenda for next week approval of architectural contract with Lyman Davidson Dooley Inc. of Marietta for design of a single-story addition to the existing Animal Shelter at 1171 Branch Road south of Farmington in the south of the county. The project also includes renovation to the interior and exterior of the existing building. Work will progress as Special Purpose Local Option Sales Tax revenue becomes available, C.J. Worden, EMA director, told the Board. Alex Perschka, county Tourism director, told the Board that the county needed to file both state and federal forms to move forward with its plans for creation of a Visitor’s Bureau. The goal is to create of a 501c(6) non-profit organization to serve as a destination marketing organization of the county. Hotel/motel tax collected by the county would go directly to the organization for tourism promotion rather than through the Chamber of Commerce as is the case at present. The Board put that on the consent agenda as well. 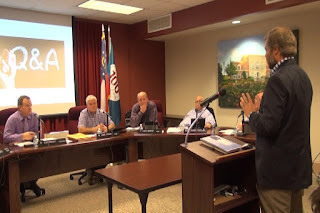 The video below is of the full Board of Commissioners meeting. Discussion of the fiber network feasibility study begins at 2:55 in the video. Discussion of the Intergovernmental Agreement with the University of North Georgia begins at 30:31 in the video. Well, if this proposed broadband goes through like my change to Atlanta Gas and Electric, my costs should triple. Isn’t broadband going to be obsolete when 5G is established? Maybe the BOC needs to keep up with the development trends in internet service. Oh, I forgot that requires reading and thought. Again, governing is above what we have in office. Please don’t do anything BOC. To the second anonymous person, 5G has a very short range and is most effective at increasing throughput and alleviating congestion in densely populated areas. In other words, it won't solve the issue of internet connectivity in our more rural parts of the county. Something needs to be done to force internet providers to build out whatever infrastructure is needed to get internet access to the most rural parts of this county. Not having access to high-speed, low cost internet that is available to the northern part of the county (Crystal Hills - 1gig up/down $85 a month) is creating a two class system and leaving not only our farmers behind in the technology that is available today, but children that live in these areas are at an extreme disadvantage. There are areas in the southern most reaches of our county where the only internet access is mobile which is slow and very expensive. If the leaders in this county are serious about keeping the southern most part of our county agricultural it is imperative that you give us the tools we need to keep up with the rest of the world or risk the loss of the farms that remain. Do not allow another foot of fiber to be laid in the northern part of the county until every home and farm in the southern end have access to high speed low cost internet, like what already exist in the northern part of the county.